For the 11th time in 16 races this season, Ryan Blaney and the No. 21 Motorcraft/Quick Lane team have qualified seventh or better. 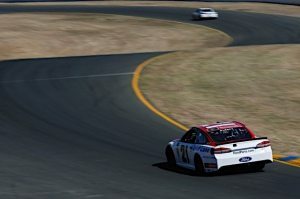 The latest came on Saturday at Sonoma Raceway where Blaney qualified seventh in just his third Cup start on a road course. Last year he qualified 26th at Sonoma and 19th at Watkins Glen, the other road course on the Cup circuit. The sophomore driver said the biggest change since last year is the experience he gained in his rookie season, both in qualifying and the races. “You need a lot of finesse, and last year everything was just so fast and I couldn’t slow anything down,” he said. “I think when you get to race at a tough place like this and can sit back after and realize what you need to do different it makes a difference. 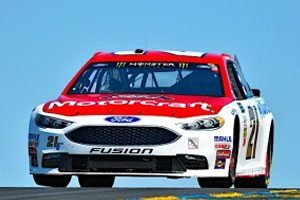 Blaney showed consistent improvement through the practices and qualifying at Sonoma. He was 19th fastest in the opening practice with a best lap at 92.805 miles per hour. He moved up to 17th place in the final practice and increased his speed to 93.422 mph. Then in qualifying, he finished 10th in the first round with a lap at 94.704 mph on his second attempt. In the final round he improved to seventh place with a lap at 94.716 mph, his best lap of the weekend so far. Sunday’s 110-lap, 350-kilometer race is set to get the green flag just after 3 p.m. Eastern Time with TV coverage on FS1.